The age makeup of the United States population is experiencing a major shift. Americans are living longer than ever before with new technologies and improved healthcare. In fact, twenty percent of our nation’s citizens will be over the age of 64 by 2030 according to the U.S. Census Bureau. To reflect the needs of our older population, marketers would be wise to begin tailoring digital and printed signage to this demographic. You can make certain that important content is being effectively and carefully communicated by enhancing visual messages. The ability for light to reach the eye is reduced by as much as 75 percent by the time people reach the age of 60. This leads to colors appearing less distinct and dimmer. For more strategic signage, marketing geared toward seniors should consider this and other health factors. When advertising to older adults, changes like less visual clutter, larger fonts for signs, typefaces for poor eyesight, color combinations for simplified reading, and low glare, high contrast designs can make all the difference. To best serve an aging population, we will show you how to create signs that cater to older customers in Los Angeles in the sections below. 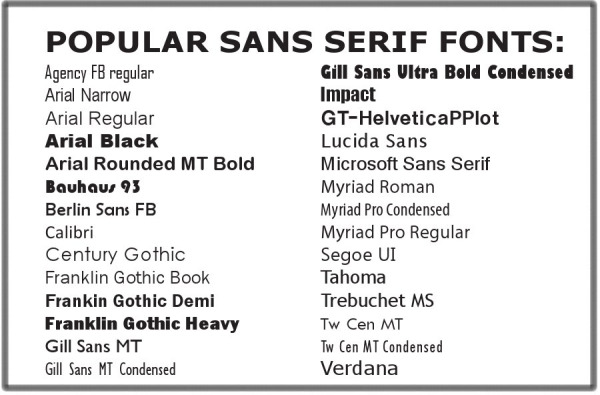 Consider sans serif typefaces for your signage fonts. These are the most readable for people with poor eyesight, since they have consistent stroke widths and larger heights. In addition, sign fonts should contrast clearly against the background and be bold. For typefaces in signage systems, both width and height ratio guidelines are set out in the Americans with Disabilities Act (ADA). This is why you need ADA signs for older customers in Los Angeles. Designers should consider the effects of colors on both mood and vision when creating signage for seniors. Colors appear grayer as people age, since the lens of the eye becomes more yellow and hardens. This makes it hard for them to distinguish green from yellow and purple from blue. It is more difficult to perceive color contrasts, so using a color wheel will aid in finding the high contrast combinations. People over the age of 65 will have a harder time of comprehending or even seeing advertisements with a lot of words. You will be much more effective in communicating to seniors with a simpler sign. For text, use plain backgrounds. And, since pictures are viewed more easily and quickly than copy, consider using graphics in the place of words. At The Sign Studio, we have extensive experience making ADA signs and signs that cater to older adults. 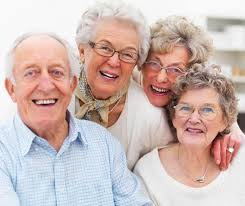 Contact us today for a free consultation on how we can make your business friendlier to seniors. Why Are ADA Compliant Signs Necessary for My Business? Many building and business owners come to us with questions like “Should I install ADA signs for my business in Los Angeles?” Or, “How do I know if I need ADA signs in Los Angeles?” The ADA website has the answers to both of these questions as well as more information about ADA compliance. However, below is what we generally tell business owners. Why Do Companies Need to Install ADA Compliant Signs? 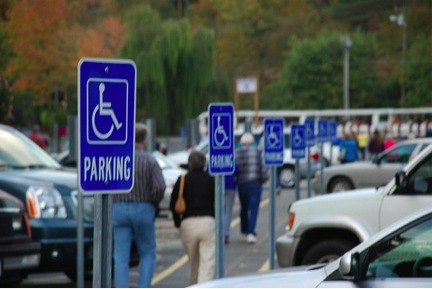 There are a variety of reasons why businesses are required by law to have ADA complaint signs. Regardless of what disabilities they may have, every person in the United States is entitled to the same rights according to the Americans with Disabilities Act (ADA). The act of discriminating against people with disabilities is effectively outlawed by the ADA. It makes sense that people are given equal chances to access goods, jobs, and services with the number of disabled people in the country and the many more who stand a chance of getting a mild to extreme disability in their lifetime. One of the several regulations that allow people with disabilities to have access to and find such services, jobs, and goods as everyone else is the use of ADA complaint signs in facilities and buildings open to the public. Why Do Signs Need to Comply with ADA Rules? There are also a lot of reasons behind the necessity for ADA complaint signs. First of all, businesses open themselves up to both lawsuits and complaints when they do not comply with the ADA regulations for signs. Since you are considered to be discriminating against people with disabilities when you are not complying with ADA rules, anyone who notices your non-compliance can file a complaint or lawsuit. People with disabilities really do need these signs to help them get around your business. This makes ADA signage quite necessary for the success of your enterprise. In fact, a lot of revenue for companies is from customers who have disabilities. Not only do they buy your products and services, but they also bring other people with them. If you do not cater to those customers with disabilities, you are potentially turning away your best clients. Which Establishments Do Not Need to Follow ADA Standards? Putting up ADA compliant signs in and around buildings is a requirement for all but a few types of facilities. Among these establishments are religious entities and the facilities they run, railroads, and private clubs that do not open their doors to the general public. Hopefully, this has shed some light on the ADA compliance guidelines. If you need more information, The Sign Studio is here to help you. We create standard as well as custom ADA signs that are up to code. Are you unsure of what signage you need? No problem! We work with a trained professional who is certified through California’s Certified Access Specialist Program and who can go through your building and break down what you need to do to meet regulations. Contact us today for a free consultation or click below for a free quote! What ADA Signs Are Required for Recreation Facilities in Los Angeles? With the passage of the Americans with Disabilities Act (ADA), it became illegal to discriminate against those individuals with disabilities. The ADA requires altered or newly constructed local or state government facilities, places of public accommodation, and commercial facilities to be usable by and readily accessible to people with disabilities. 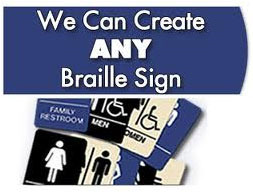 Part of these requirements is having the right ADA signs for recreation facilities. 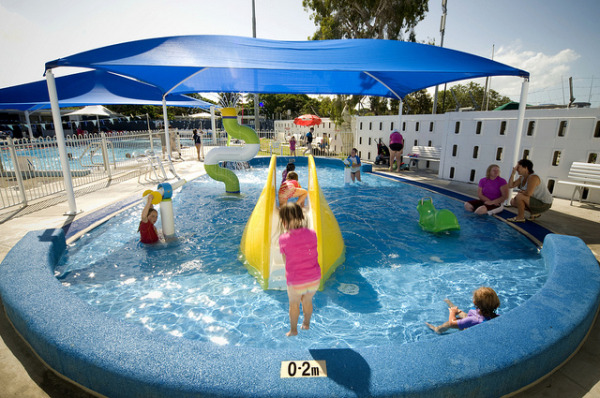 There are specific signage requirements for various types of recreational facilities. To indicate the kind of access provided by rides, signage must be provided at the entrance of the waiting line or queue for each accessible amusement ride. 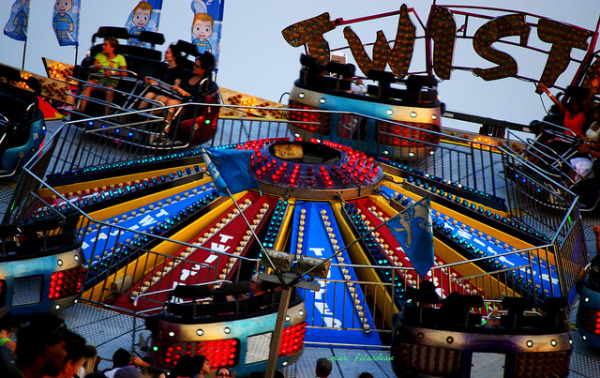 For example, you may have a sign that indicates there are transfer rides or that the ride has wheelchair spaces. In addition, so that riders can avoid unnecessary backtracking, there must be signage indicating the location of the accessible load area if the route for accessible load areas are different for people with disabilities than that for other riders. The above also holds true for other recreational facilities. All of the accessible routes for those people with disabilities must be clearly marked so as to avoid any backtracking. These are not the only requirements. 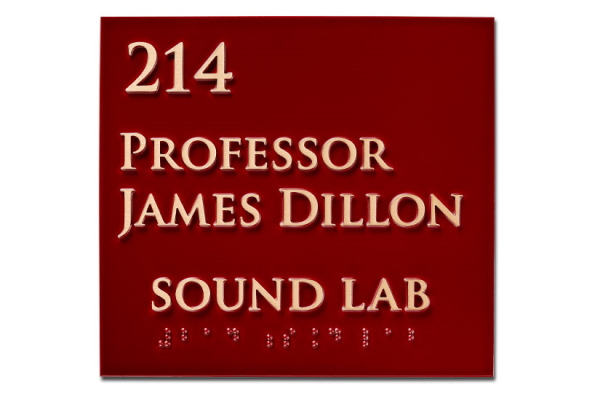 Many sign types also require the addition of Braille, the raised dots that accompany the text of a sign. Room signs, restrooms, stairways, exits, handicap access points, exit routes, and other permanent sings are required to have Braille in any recreational facilities that are open to the public. 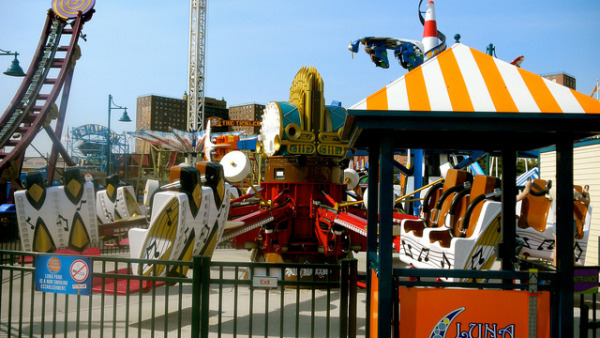 The Sign Studio specializes in ADA signs for amusement parks. Los Angeles businesses can pick from our full line of standard signs, or we can create something custom to match your company’s branding. We even have you covered if you are confused about what signs you need to be compliant. We can send a trained professional, who is certified by California’s Certified Access Specialist Program, to your building to determine what is needed. If you are ready to make your recreation facility inviting for disabled people, give us a call today for a free consultation! Few people realize that they can get custom metal plaques from a commercial sign company. Yet, The Sign Studio has been offering Gemini metal plaques for many years now. These plaques are what we use when businesses come to us for long lasting metal plaques for ADA signs in CA. 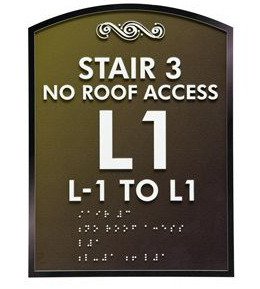 What are the benefits to using Gemini metal plaques for your ADA signs? This blog will answer this question and more. Gemini Incorporated manufactures all of the metal plaques that we offer, and we customize the plaques to meet your requirements. Gemini has been a world renowned name in the signage industry for over 50 years. Plus, for two decades, they have been producing high quality metal plaques that have become the standard in the recognition, sign, and award industries. 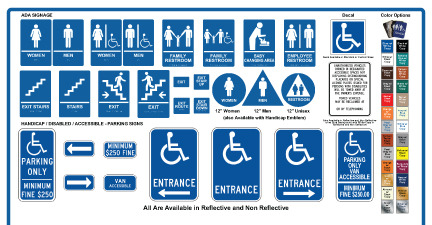 You are sure to be impressed by the array of options for ADA signage that Gemini offers. When the Americans with Disabilities Act (ADA) became law in 1993, business owners had a lot of questions about compliance. 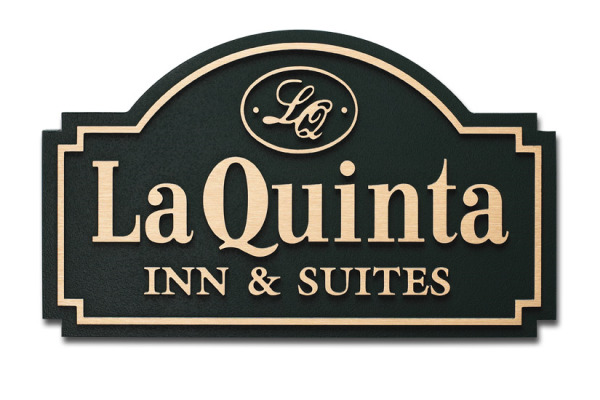 Whether you are requesting custom designed pieces that seamlessly blend into your office or if you are just ordering standard plaques, our design team in conjunction with the quality control and manufacturing standards at Gemini will make certain that your ADA markers and signage are in compliance. Your imagination is the only limiting factor when choosing the design, shape, and color of your ADA plaques. You will not just be up to code when you choose our ADA compliant signage. You will also aid in reducing the difficulties for disabled individuals trying to make their way through everyday situations on their own. Plus, we do not just want to make ADA signage more user friendly for those with disabilities. We want to make it better for everyone. As mentioned above, we can customize Gemini metal plaques for ADA signs in CA to be exactly how you want them. All of the plaques are made from one piece all metal construction. This means that the braille, design elements or emblem, and copy are all part of the body of the plaque. Consequently, they will never crack, chip, or have missing lettering or braille indicia. To deliver a plaque that is completely customized for your application, we combine our full color, high resolution printing with top quality plaques. Through our cutting edge printing processes, we can achieve up to 1200 dpi resolution. 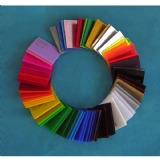 The quality of the image provided for reproduction is the only limitation on design for the plaques. Plus, we make sure there is a sufficient contrast between lettering and the background to meet ADA regulations. Your ADA signs will also be protected by a vandal resistant powdercoat finish whether you choose a metal finish, single color, or full color plaque. In addition, your plaques will be protected from most wear and tear found in various environments. ADA requirements are strict in California. ADA metal plaques provide an affordable, long lasting way to comply. Contact The Sign Studio today for a free consultation. 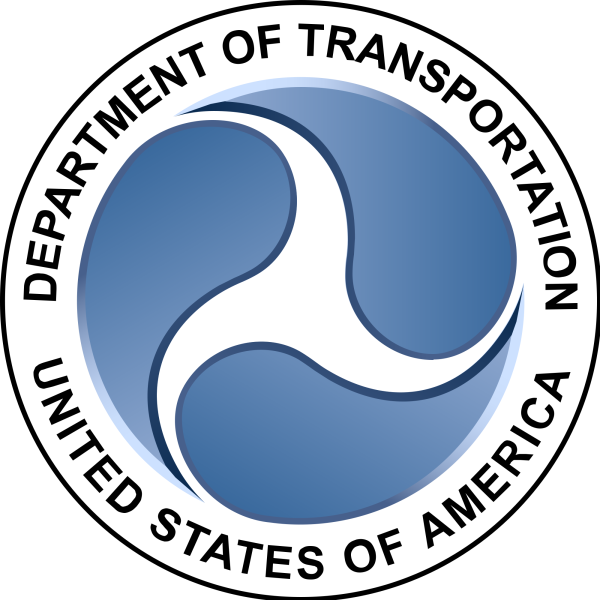 When Are You Required to Display USDOT Vinyl Lettering and Numbers? In order for you to operate your vehicle legally, United States Department of Transportation (DOT) numbers may be required if you move cargo or people across state lines or drive a commercial vehicle. You must register with the Federal Motor Carrier Safety Administration (FMCSA) to get your USDOT number. This must then be displayed on your vehicle. Your DOT number is used for a variety of purposes, including when conducting audits and reviews, monitoring safety records, during crash investigations, and when completing inspections. The Sign Studio has a lot of experience with USDOT vinyl lettering and numbers. Here is an overview of what you need to know. The vehicle is used or designed to transport sixteen passengers or more, which includes the driver, and is not used to transport the passengers for pay. 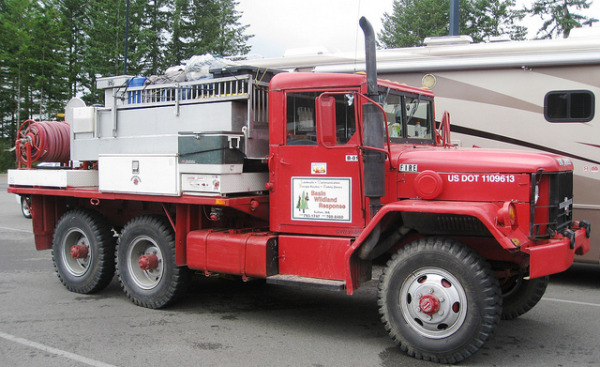 The truck has either a gross combination weight or gross vehicle weight of more than 10,000 pounds. The vehicle is used to transport material that is found to be hazardous by the Secretary of Transportation and in a quantity that requires placarding. The truck is used or designed to transport nine or more people, including the driver, for pay. The numbers are required to be posted on both sides of the commercial vehicle, though FMCSA does not specify an exact location. Before applying the numbers, it is a good idea to measure the space you are considering to make sure the numbers will fit. From 50 feet away, people should be able to read your numbers when your truck is parked. This means using letters and numbers that are a minimum of two inches tall. Also, the numbers should be in stark contrast to the vehicle color. So, a dark truck would have white letters, and a light colored truck would have black letters. 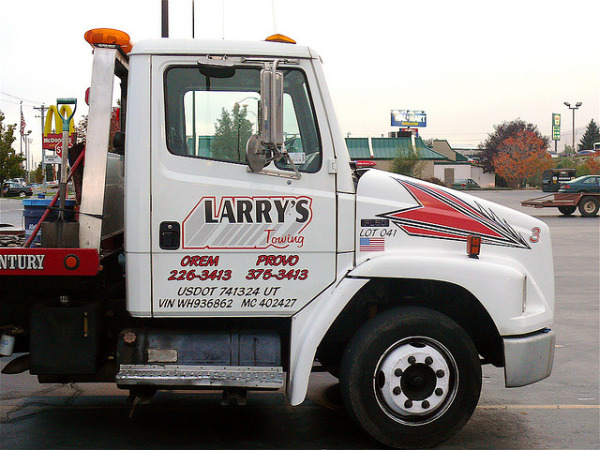 The Sign Studio has years of experience providing USDOT truck lettering. Los Angeles businesses have a variety of options to choose from. The least expensive and most popular option is standard lettering. These are no frills, pre-printed numbers and letters using common colors. Some companies prefer to get creative with their DOT lettering. Los Angeles companies can get custom letters that match their branding. This option makes your commercial vehicle look more attractive, rather than the DOT numbers serving as an eyesore. While you are getting your DOT numbers, it is also a perfect time to consider sharp, vibrant spot graphics with your company name and logo for your fleet of trucks. Vehicle graphics are the most effective marketing tool on the road today. Complying with DOT number regulations is the responsibility of the commercial carrier, both drivers and owners. There is no excuse for ignorance of the law. You can contact The Sign Studio if you have any questions about displaying DOT number or if you would like us to produce or install your numbers. Call today for a free consultation.